Tourists can send postcards from just about anywhere in the world – but have you ever received a letter from under the sea? 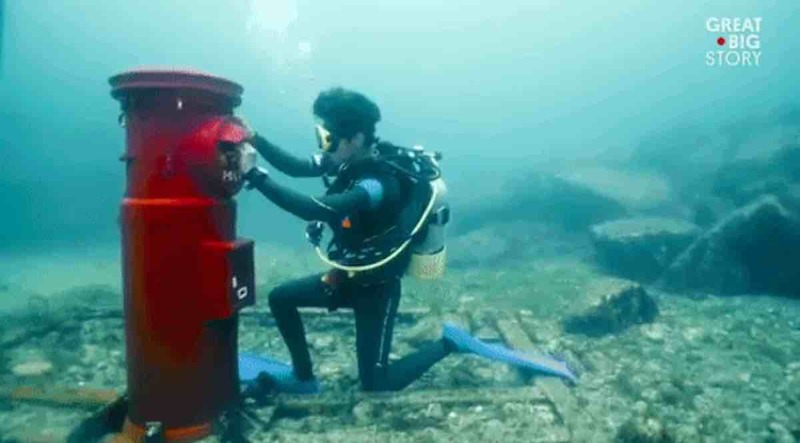 Former postmaster Toshihiko Matsumoto first came up with the idea for the world’s only underwater mailbox as a means of attracting more visitors to his town of Susami in the Nishimuro District of Japan – and it worked. Since the unique attraction was first planted off the coast of the village, over 38,000 postcards have been mailed through the underwater post box. The mail, which is all written in oil on waterproof paper, is collected every day by dive shop owner Hiroaki Yamatani and delivered to the post office where they are sent to their respective addresses. In addition to being the world’s only underwater mailbox, it also holds the Guinness World Record for being the world’s deepest mailbox at 32 feet (100 meters) deep.